Names matter, even when they're temporary nicknames for objects 4.1 billion miles (6.6 billion kilometers) away from Earth. Just such a nickname — Ultima Thule (pronounced TOOL-ie), for New Horizons' recent flyby target, 2014 MU69 — stirred controversy on Twitter late last night and early today (Jan. 1 and 2). NASA's New Horizons mission flew by the object early on Jan. 1, and the maneuver's science data will reach Earth over the course of nearly two months. Those concerns were apparently prompted by an article I wrote for Newsweek in March, immediately after the nickname was announced, after searching for the term in Google Scholar and discovering references to the Nazi party on the first page of results. At the time, and again today, New Horizons personnel defended the choice, citing its original connotations. "I've said it a number of times, I think New Horizons is an example — one of the best examples in our time — of raw exploration, and the term Ultima Thule, which is very old, many centuries old, possibly over a thousand years old, is a wonderful meme for exploration," Stern said. "That's why we chose it. I would say that just because some bad guys once liked that term, we're not going to let them hijack it." The statement was greeted by applause from news conference attendees. During his science presentation, Stern also referred to the two lobes of the space rock as "Ultima" (the larger lobe) and "Thule" (the smaller one). In its original use, the term Ultima Thule is ancient, first used during the Roman Empire and also popular during the medieval period, referencing lands that are both very distant and very cold — which the Kuiper Belt object of course is. But centuries later, Nazis appropriated the term to apply to a mythological Aryan homeland, incorporating it into their racist and anti-Semitic worldview. In March, NASA and the New Horizons team announced their decision to use Ultima Thule as a nickname for the second stop on their solar system tour, which is officially known as 2014 MU69, a formula that designates when it was discovered. "Ultima Thule" was one of 37 contenders that the New Horizons team selected from 34,000 public suggestions and put to the vote. Other options people could vote for included Año Nuevo, Denali, Lewis & Clark, Peanut/Almond/Cashew and Terra Nova. At the end of that process, it ranked 7th, but the team chose it over the more popular options. In March, Showalter seemed to emphasize frustration at the object's formal name as much as enthusiasm for the specific nickname the team settled on. 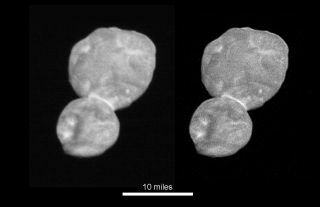 "We're very, very tired of talking about 2014 MU69," Showalter said in March. "Any name is better than 2014 MU69."